Since the introduction of ReserveIt! 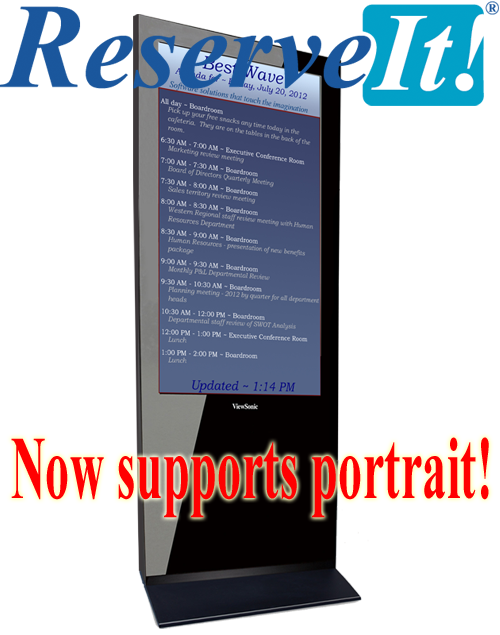 two years ago, we have received numerous requests to add portrait display support. Now, with ReserveIt! 2.0, that request is reality. The most important use of this new feature is to place a large format display in the lobby or entrance area of a building with the combined agenda from all conference rooms. This display can be shown on any large-format portrait LCD, or most elegantly on the Viewsonic E-Poster displays like the one shown here. ReserveIt! 2.0 also allows advertising and promotional images to be shown along with the agenda, both on the individual room displays outside of every conference room, and on the large screen in the lobby. More than one image, in JPG or BMP format may be attached to any agenda item within your Outlook or other calendar system. ReserveIt! can even distinguish which images are to be shown on the individual room displays and which are meant for the all-rooms display. This allows the use of different ads for each location. We have also added word wrapping to events shown in all orientations and formats. This accommodates long event names cleanly and allows you to convey more information to your guests about each event. Try out ReserveIt! today. You will love its simplicity, power, and low cost.